Some part of your early childhood dreams likely involved 1) Times Square, and 2) access to large quantities of sugary cereal. Maybe those two dreams weren’t in conjunction (and if they were, wow, you really should have spoken up about that business idea earlier! 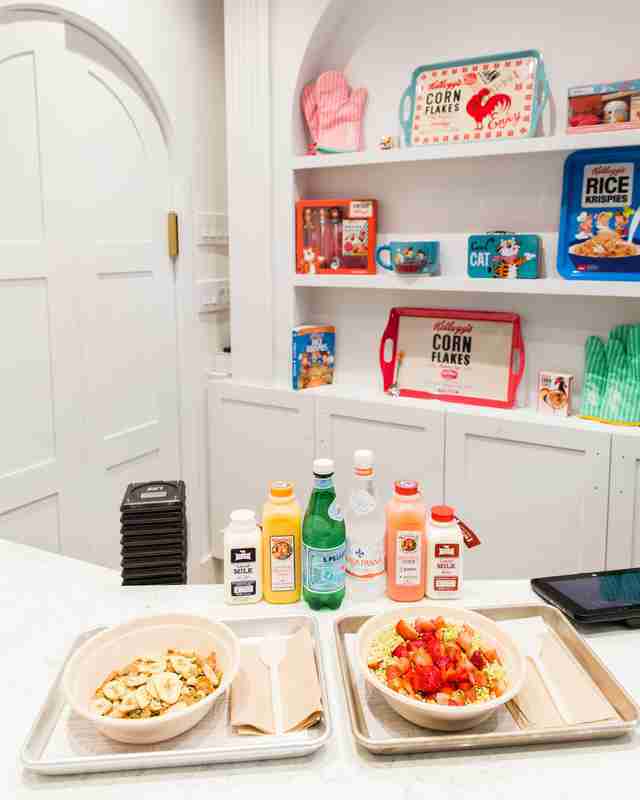 ), but bright lights and a bowl of Frosted Flakes probably would have been enough to keep your six-year-old self appeased ‘til Christmas -- and Kellogg’s new all-cereal cafe, opening on July 4th in Times Square, just made it a reality. But is your adult self really up for paying $7.50 for a bowl of cereal that you had to trek past hoards of tourists and strange men dressed like Elmo in order to get? Well, for starters, the cafe, called simply Kellogg’s NYC, is probably the least Times Square-looking place in Times Square, even if it is located on Broadway between 48th and 49th. It's probably more akin to a cafe in Greenpoint than the M&M store, with white-painted exposed brick and minimalist modern decor. 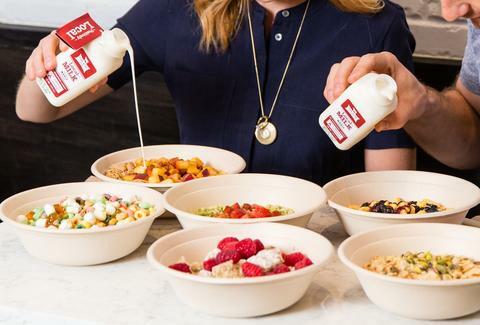 Plus, there's a heavy-hitter behind the "elevated" cereal -- Milk Bar’s Christina Tosi, the brains behind the bakery’s famed Cereal Milk and Cereal Milk Soft Serve. 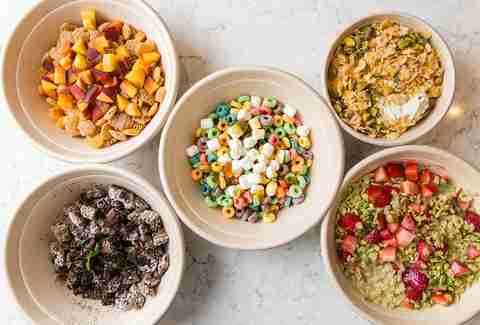 On the menu you’ll find bowls of Rice Krispies topped with fresh strawberries and green tea powder; Corn Pops with blueberry jam, lemon zest, and a pinch of salt; and several cereal sundaes -- like the Life in Color with Froot Loops, lime, marshmallows, and passion fruit jam. Each bowl of cereal can be made with either Five Acre Farms milk or Blue Marble soft serve ice cream. There's also an option to build your own. Of course, the bowls look way nicer than anything you’d think to put together yourself, though the idea is that these are low-maintenance recipes. “I didn’t want to create anything you couldn’t create at home,” Tosi told Thrillist. The space was also designed to embody an "at-home" feel. Once you order, you're given a buzzer that'll flash a number when your food is ready -- those numbers correspond to a wall of red cabinets, which you can open to pick up your food, just like you'd pull a cereal box from the cabinet at home (if you happened to live somewhere other than New York City with the pleasure of roomy kitchen cabinets). They'll also be handing out prizes behind those doors, says Anthony Rudolf, the designer and co-owner (previously of Thomas Keller Restaurant Group). One lucky customer could even win a pair of Hamilton tickets. As homey as the space may feel, it’s also worth pointing out that a plain bowl of Special K with no toppings (from the create-your-own option) will cost you $4.50 for a regular size, and $3.50 for a small -- whereas an entire 7oz box of Special K will cost you $3.79 at Key Food. Still, you didn’t come here just for a bowl of cereal... or maybe you did! Very likely, though, you came for the experience of an all-cereal cafe, which could help justify the higher price tag (the streetwear brand KITH successfully started selling $6 and $7 custom cereal bowls earlier this year at its “cereal bar” in Prospect Heights). And the Kellogg’s cafe certainly offers an experience. So will Kellogg’s NYC be able to skirt the typical Times Square shun like Pete Wells' beloved Señor Frog's? 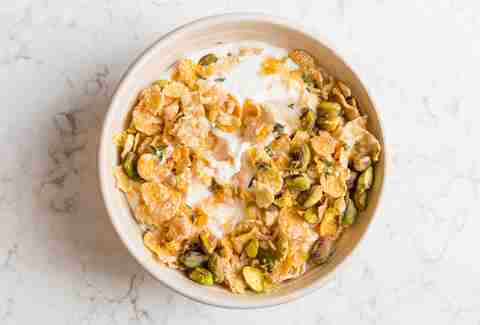 Is it possible that millennials (the company’s target audience for the cafe) will gamely venture to Times Square for a bowl of cereal? Maybe... but it's still Times Square. Then again, Christina Tosi has gotten people plenty excited about cereal before; it only seems logical that she’d be the one to do it again. Lucy Meilus is Thrillist's New York Editor and generally a Cinnamon Toast Crunch girl, but feels good about Kellogg's Frosted Flakes, too. Follow her on Twitter and Instagram.